Don't assume that this is a gimmick since it contains an alarm. 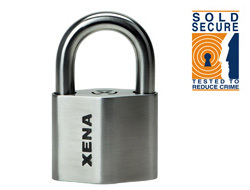 Even with the alarm disabled it is one of our most secure padlocks at an excellent price. 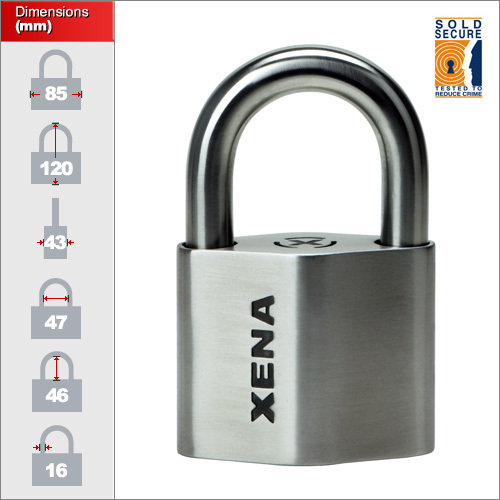 It is the first and only high-end alarm padlock on the UK market and is the culmination of XENA's 10 years of experience at the cutting-edge of padlock design. The body is constructed from solid stainless steel using a huge 16mm thick shackle for maximum resistance agaist cutting and bolt croppers. 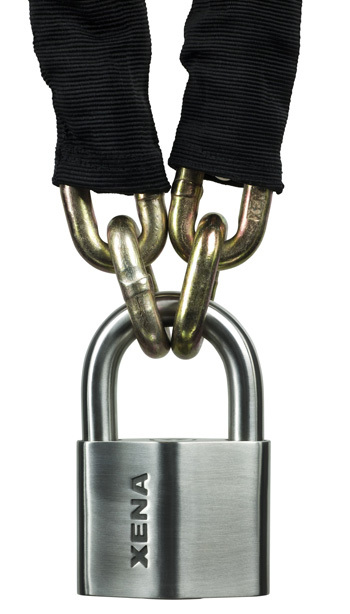 A thin shackle version is available for use with chains. It is important to remember this padlock can be locked with the alarm de-activated and used as a traditional high security padlock. You may also wish to de-activate the alarm when the item you are securing could be knocked accidently or used in high wind conditions. We have one size in this model but with 3 different shackle dimensions of 46mm clearance, 69mm clearance and a special thin shackled model also with 46mm clearance. Please select your choice from the drop-down list above and then click "full size and dimensions". The lock is useful in any security situation especially for motorbikes and gates where someone might try and tamper with the security measures. It is also exceptional in preventing trespass or vandalism where the movement caused by someone jumping over a gate will trigger the alarm. Each lock contains a shock and movement sensor connected to a microprocessor triggering a 110 dB alarm which is not as loud as a car alarm but loud enough be effective. The sensor is also intelligent enough not to trigger by minor movements caused by wind. The lock will beep for 5 seconds before the alarm is activated allowing you to unlock it. If activate the alarm will sound for around 15 seconds before resetting to its original state. It can be activate multiple times if the lock is continually tampered with. It is important to note that cheaper alternatives are not controlled by variable microprocessors and can sometimes be activated accidentally by wind or rain.